Call it a spiritual shot in the arm. To paraphrase the Joker from 1989’s “Batman,” this town … needs a culture change. The Florida Family Policy Council, led by longtime conservative activist John Stemberger, has just the prescription. A spiritual shot in the arm, if you will. A spiritual booster shot: John Stemberger is calling on pastors to descend on Tallahassee starting this month to meet – and pray – with elected officials. Because it’s bad up there at 400 South Monroe St.
“In the 30-odd years I have been observing the Legislature, marriages, families, and personal reputations are often destroyed … because the world, the flesh, and the enemy himself are all right there with the temptation, the vice and the intoxication of power that comes with the territory,” Stemberger writes. 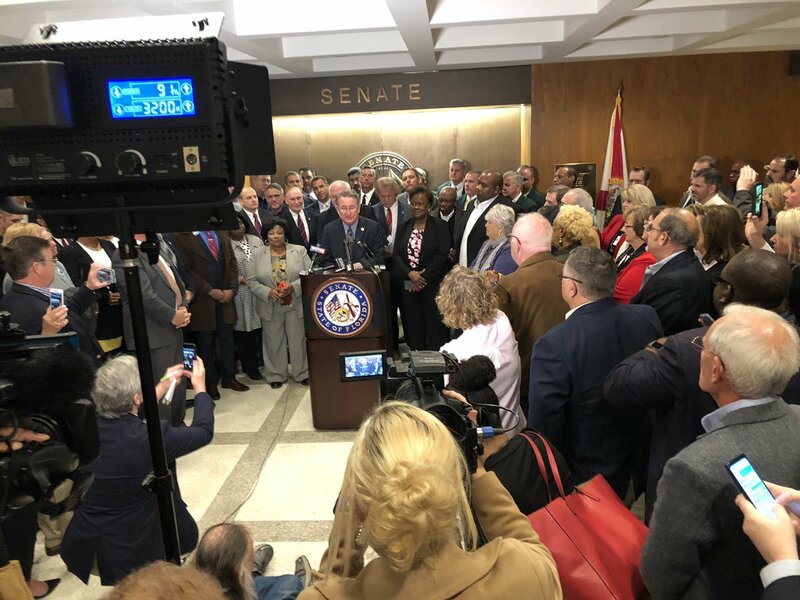 Thus, “The Florida Capitol Project.” It will shuttle pastors to the Capitol complex on Mondays and Tuesdays starting March 25. The pastors will hold dinner briefings Monday nights, and spend Tuesdays meeting and praying with lawmakers one-on-one. And honestly, why not? It’s worked elsewhere. 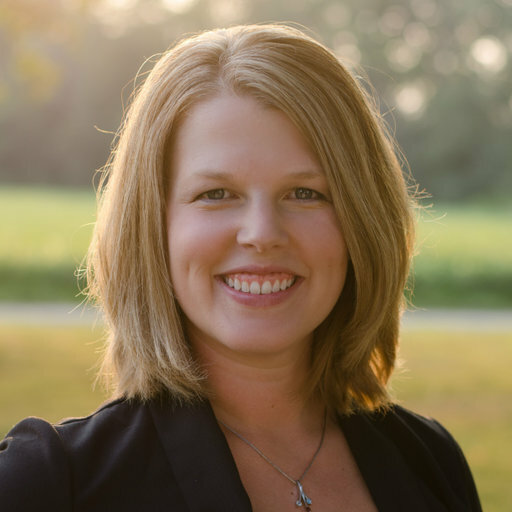 Stemberger says pastors’ presence has done the charm in Iowa, Ohio, and Wisconsin. Pennsylvania is giving it a try, too. The project needs a bit of a boost, though. Donations help, but Stemberger said he also needs churchgoers to urge their pastors to volunteer for the cause. Coming up, the usual assortment of tidbits, leftovers and not-ready-for-prime-time moments by Danny McAuliffe, Drew Wilson, Jim Rosica, Michael Moline and Peter Schorsch. 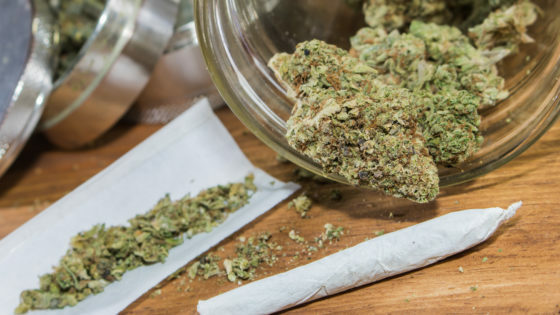 DeSantis secures pot priority — The Florida House this week overwhelmingly voted in favor of repealing the ban on smokable medical marijuana. That sent the legislation to Gov. Ron DeSantis’ desk in time for the March 15 deadline he imposed on lawmakers earlier this year. 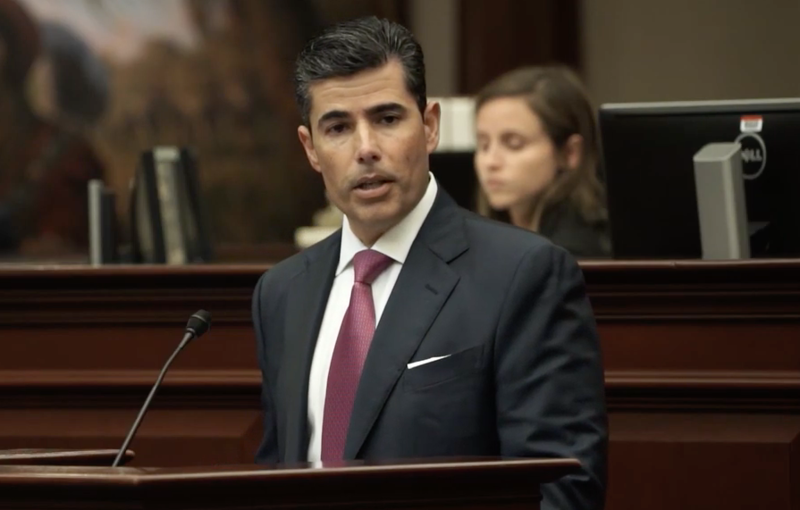 If lawmakers failed to pass the legislation, DeSantis said he’d drop the state’s appeal to a lower-court ruling that found the no-smoke ban unconstitutional. 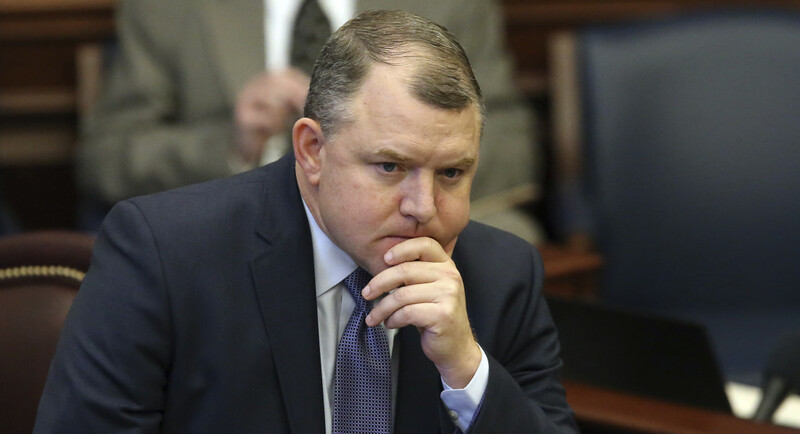 “I thank the Florida Legislature for taking action on medical marijuana and upholding the will of the voters.” Under the state constitution, he has until Wednesday to sign it, or it automatically becomes law without his approval. 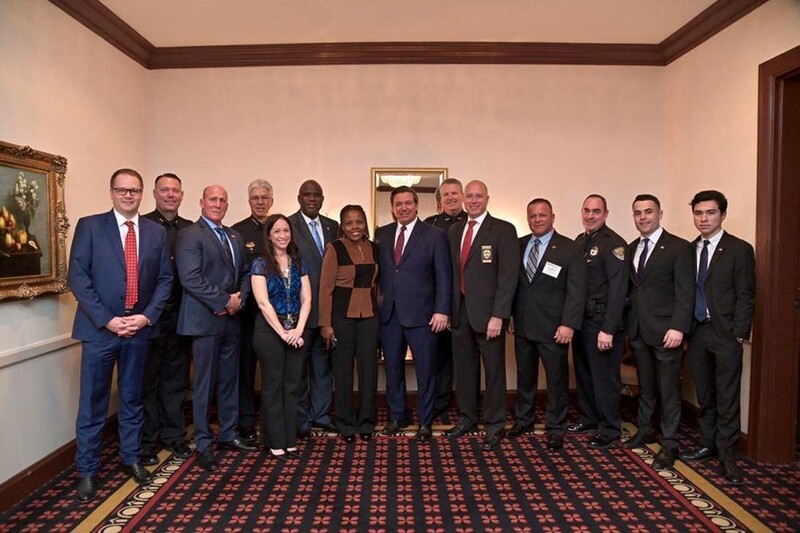 Senate pauses Broward Sheriff hearing — Senate President Bill Galvano this week said the Senate’s hearing regarding suspended Broward County Sheriff Scott Israel would be “held in abeyance” as a result of a lawsuit filed by Israel against DeSantis. Special Master Dudley Goodlette, who Galvano assigned to the case, recommended the pause. Galvano accepted. Galvano’s decision comes less than a week after Israel filed a petition for a writ of quo warranto in Broward County circuit court. The suit asks for Israel to be reinstated as Sheriff of Broward County, arguing DeSantis’ decision was politically motivated. DeSantis earlier this year suspended Israel, citing the Broward Sheriff’s Office’s handling of the Parkland and Fort Lauderdale Airport shootings. 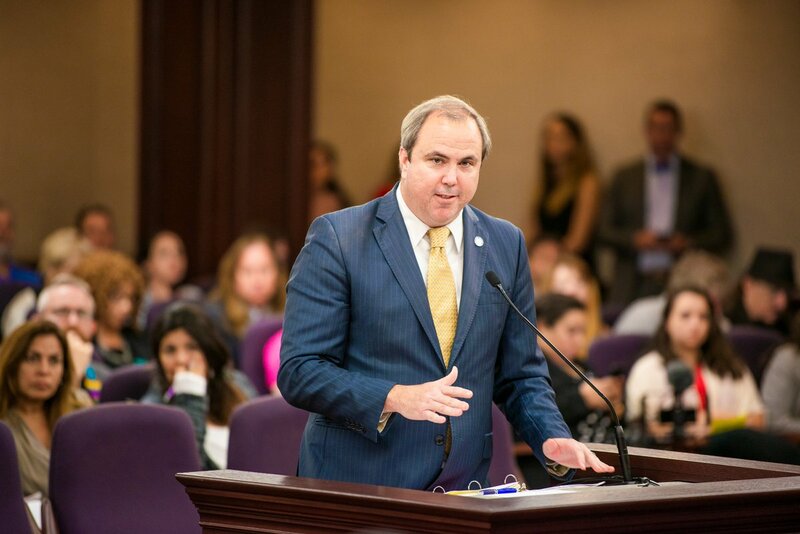 Voucher plan on the move — A House Education Committee advanced a bill this week that aims to eliminate the waiting list for the estimated 14,000 students who’ve applied but have not received Florida Tax Credit Scholarships, which funds private-school vouchers for lower-income students. The proposal would create the Family Empowerment Scholarship program, funded in part by state dollars instead of solely tax credits. The House plan currently would extend to families at 300 percent of the federal poverty level during the 2019-2020 school year. The Senate plan currently extends to families at up to 260 percent of the federal poverty level. In general, the proposal is another DeSantis priority. VISIT FLORIDA fight looms — A measure to reauthorize the state’s premier tourism-marketing agency moved forward through a key Senate panel this week. But Florida House Speaker José Oliva appears unwilling to take up the same measure, which would in effect sunset VISIT FLORIDA come October. “Right now, the only direction has been that we need to fund VISIT FLORIDA until it expires, and beyond that, we haven’t had any intention,” Oliva told reporters this week. The Senate Appropriations Committee, soon after, backed the proposal (SB 178). 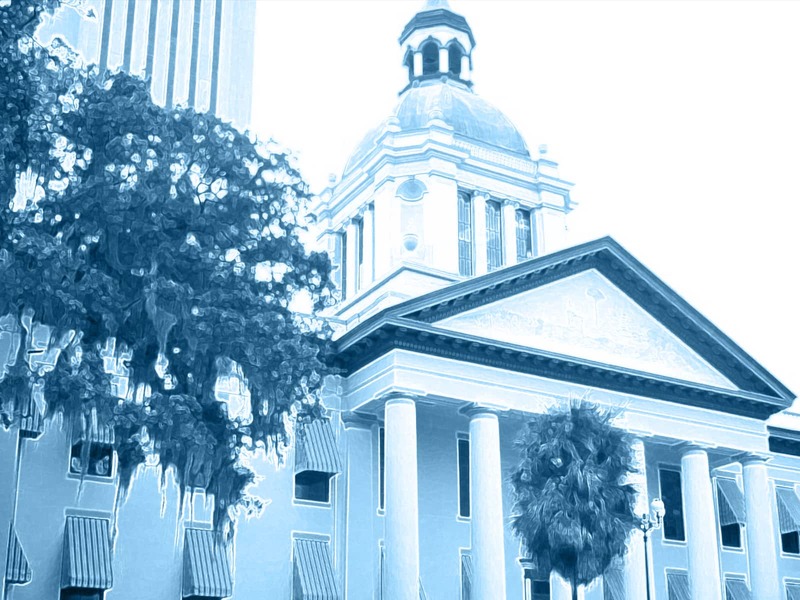 DeSantis has recommended keeping funding steady for the agency with another $76 million in appropriations for the next fiscal year. The Governor doesn’t always suspend a local official when he visits South Florida. DeSantis this week spoke to more than 1,000 business and community leaders at the Broward Workshop in a friendly visit to the county. Ron DeSantis celebrates the Broward business community, with a friendly visit to the area this week for a speech to more than a thousand business and community leaders. 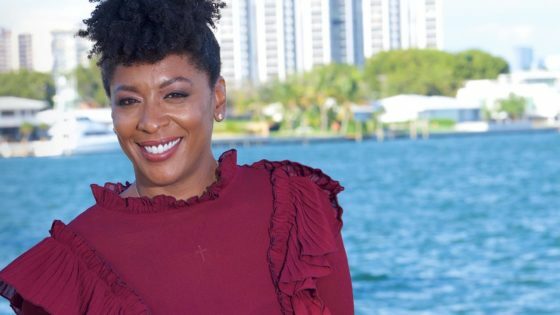 The group “is a private, nonprofit business organization that works to facilitate positive solutions to pressing issues facing Broward County,” a DeSantis news release said. While he hasn’t branded himself as the “jobs” guy like his predecessor, DeSantis certainly isn’t letting the economy fade from the fore. The Governor is taking a swing at the state’s water-quality crisis. First Lady Casey DeSantis is helping with the follow-through. First Lady Casey DeSantis and DEP Secretary Noah Valenstein joined representatives from Coastal Conservation Association Florida, Duke Energy and the Florida Fish and Wildlife Conservation Commission to continue red tide recovery efforts with the shoreline release of more than 2,000 redfish in Collier County. DeSantis — who has had a visible presence in the administration — recently joined Department of Environmental Protection Secretary Noah Valenstein to release more than 2,000 redfish in Collier County. 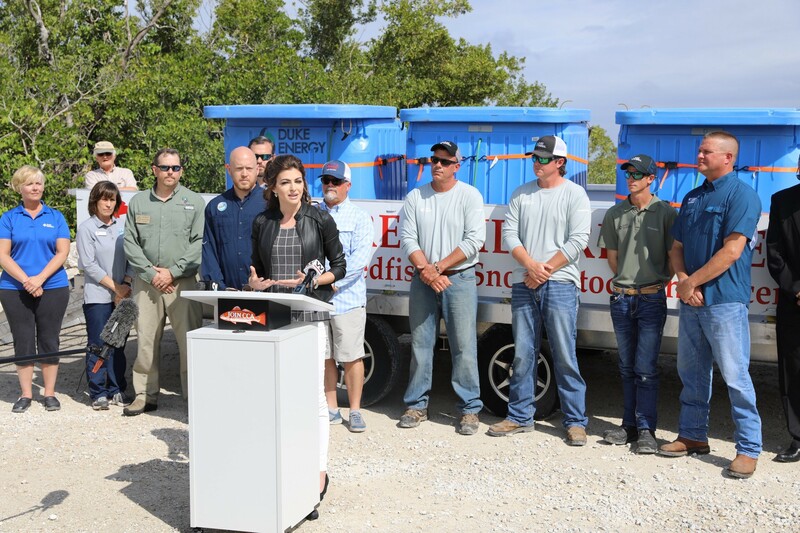 Flanked by folks from the Coastal Conservation Association Florida, Duke Energy and the Florida Fish and Wildlife Conservation Commission, Casey DeSantis helped reintroduce to nearby waters the vital species, which has suffered decline from recent red tide algae outbreaks. “With the release of this new life in the water, there is new life in our efforts to protect and restore our environment. I’ve heard from those throughout Florida who understand that our water must be safe for our families, visitors and economy,” DeSantis said. Legislation moving through the Senate would require local law enforcement to cooperate with federal immigration authorities. The bill (SB 168) aims at so-called sanctuary cities. Republican state Sen. Joe Gruters sponsor it and this week advanced through a party-split vote in the chamber’s Infrastructure and Security Committee. Senate President Bill Galvano is open to Joe Gruters highly controversial immigration bill. Image via Twitter. 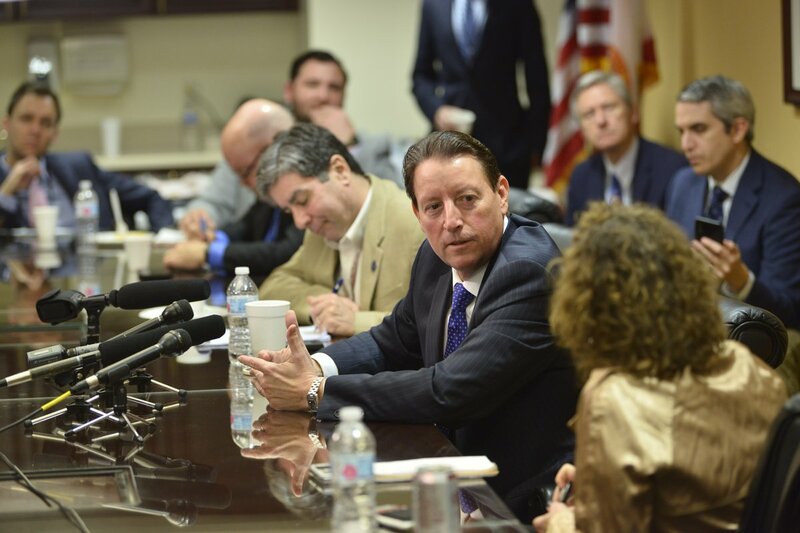 Senate President Bill Galvano told reporters earlier this week that he finds the bill agreeable, rhetoric that suggests it has a chance of passing through the upper chamber, where similar legislation died last year. “I think the bill that’s been put together is very simple: Abide by the law and to respect the federal requirements that exist,” Galvano, a Bradenton Republican, said. Oliva open to Galvano priority? It’s no secret that the Senate President wants to leave a legacy defined in part by significant transportation projects. 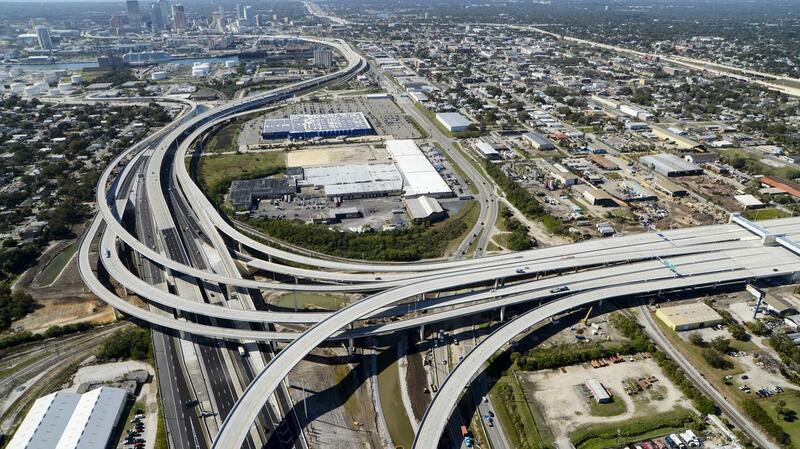 Among them: Extending the Suncoast Parkway to the Florida-Georgia border. A bill (SPB 7068) moving through the Senate would take the first steps needed to do that, along with other infrastructure developments. I’m listening: José Oliva is willing to give Bill Galvano’s transportation priority some serious consideration. But a potential sticking point could be financing the project. Oliva said he’s “not a big fan of bonding,” currently a major proposed funding source for the project. State Sen. Darryl Rouson wants lawmakers to pass broad legislation (SB 704) that would allow sentencing reform to apply retroactively, and something voters passed through Amendment 11 last year. State Sen. Tom Lee and Attorney General Ashley Moody want to do the same, but through a narrower approach. Ana Ceballos of the News Service of Florida reported that Moody and Lee want to prevent “chaos” in the court system, anticipating that without constraints, too many prisoners would try to appeal their sentences. Preventing chaos in the system: Tom Lee, along with Attorney Gen. Ashley Moody, wants sentencing reform, but with a narrower approach than some would like. Rouson said he’s hoping for healthy debate surrounding his measure and Lee’s (SB 1656) in the meantime. Senate Appropriations Chair Rob Bradley will be tasked with addressing costly relief for Hurricane Michael. The problem? Getting money to Northwest Florida while reimbursement awaits. Bradley, speaking to reporters this week, commended President Donald Trump’s 45-day extension of the 100 percent federal cost share for debris removal and emergency protective services. Doing the heavy lifting: As Appropriations Chair, Rob Bradley faces a challenge of getting costly Hurricane Michael relief to where it is needed most. The big but: “That is not cash that we’re seeing right now,” Bradley said. We asked what he thought of a $315 loan proposal (SB 1610) by state Senators from the area hit hardest by the near-Category 5 storm. BP settlement dollars for Hurricane Michael? A Senate panel this week temporarily postponed hurricane relief legislation funded by dollars from the state’s $2 billion settlement that followed the 2010 Deepwater Horizon oil spill. However, the measure is on the agenda for the next Commerce and Tourism committee meeting Monday. The bill (SB 1162) would create the Northwest Florida Rural Inland Affected Counties Recovery Fund. Sen. George Gainer, a Panama City Republican, is its sponsor. In the House, Eucheeanna Republican Rep. Brad Drake is carrying a similar proposal. Cash flow: George Gainer is pushing a bill to set up a recovery fund for Florida’s rural inland areas affected by Hurricane Michael, using BP settlement money. Under Gainer’s legislation, 5 percent of all settlement payments received after July 1 would go toward the fund. The settlement totals $2 billion. The nonprofit Triumph Gulf Coast currently oversees the dispersal of 75 percent of that sum. Counties eligible for that money include Escambia, Santa Rosa, Okaloosa, Walton, Bay, Gulf, Franklin and Wakulla. Be careful how you describe Sen. Gruters’ tax overhaul. The Sarasota Republican is pushing a bill (SB 1112) that does a whole lot of things. But in part, it seeks to require online marketplace providers to collect and remit sales taxes on products sold by third-party online retailers. Gruters gave an example: Selling widgets on Amazon, but shipping them himself. Increase? What increase? Joe Gruters is advancing a tax overhaul bill that would do several things — but don’t call it a tax increase. “Those are part of the products that aren’t taxed right now, unless the consumer pays the tax individually,” Gruters told reporters this week. Here’s the kicker: Gruters envisions whatever extra revenue brought in can be offset by a proposed decrease in the commercial rent tax. That’s something he thinks can win over his fellow right-leaning colleagues. He might be right. It unanimously advanced earlier this week through the Commerce and Tourism Committee. The Leroy Collins Institute is on board with limiting the Constitution Revision Commission to single subject amendments — no more drilling and vaping wombo-combos. 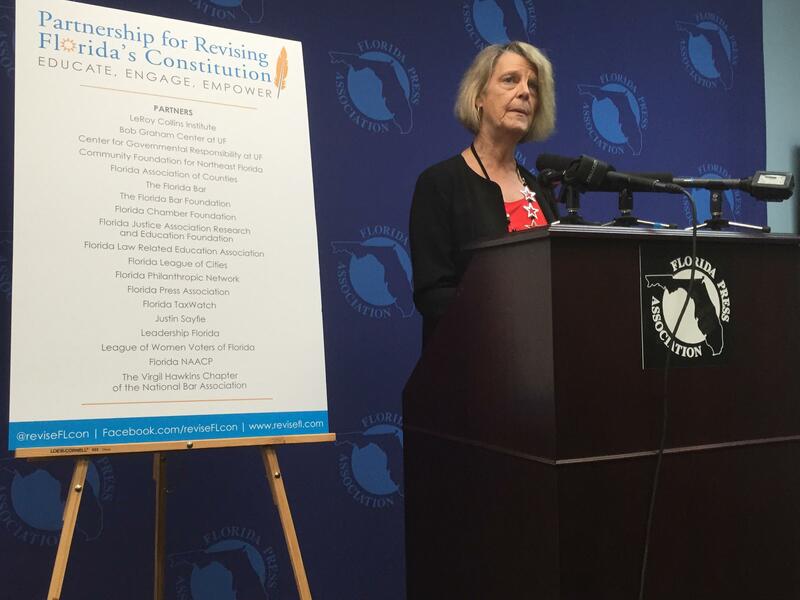 The Institute said the Legislature needs to slow down on trashing the CRC altogether, though. 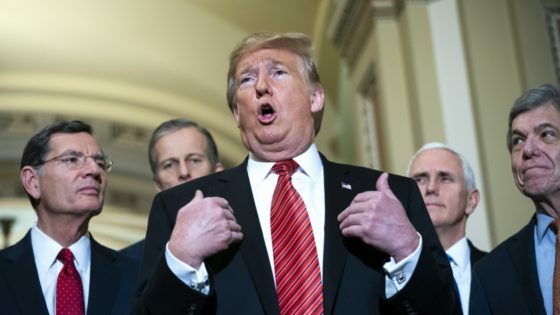 “Clearly bundling of disparate issues can be a problem with an electorate that is not well-informed on issues and with voters who might support one part of the amendment but not another,” said LeRoy Collins Institute director Carol Weissert. The Institute says lawmakers need only look at history to see why the CRC should stick around. Before it was put in place, Floridians grew increasingly frustrated trying to get constitutional changes past an intractable Legislature. “Florida’s CRC process is worth saving,” said Lester Abberger, chair of the Leroy Collins Institute board. Florida gets $10 to $15 back. 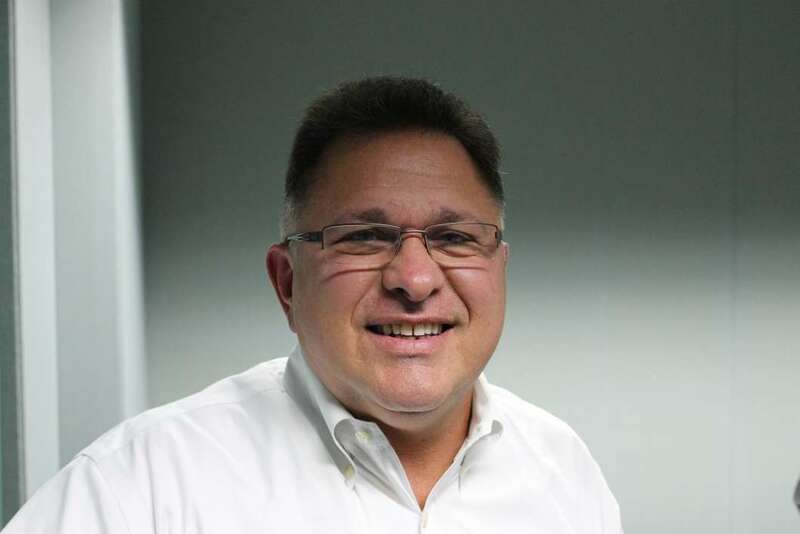 “Florida’s college system has provided an opportunity for generations of Floridians to have a better life, and the return on the state’s taxpayers’ investment has been significant,” said Florida TaxWatch head Dominic Calabro. Solid ROI: Florida’s college system offers a healthy return on investment, helping businesses find employees who have the right skills, says Toby Overdorf. The report found colleges are more than just a boon for the state’s bottom line — they also boost lifetime earnings for students and are doing a good job making sure enrollees graduate. Also, Florida businesses need a platoon of educated workers to keep the economy churning, and state colleges are an efficient way to meet their demand. 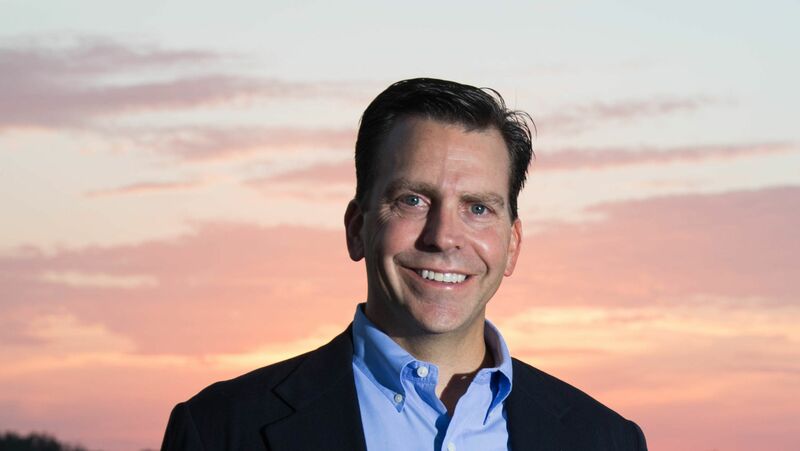 “There are thousands of job openings in Florida because businesses cannot find employees with the set of skills they are looking for,” state Rep. Toby Overdorf said. Tallahassee state Sen. Bill Montford took to the Senate floor this week to recognize three deaths that have shook his district. The first for Air Force Sgt. 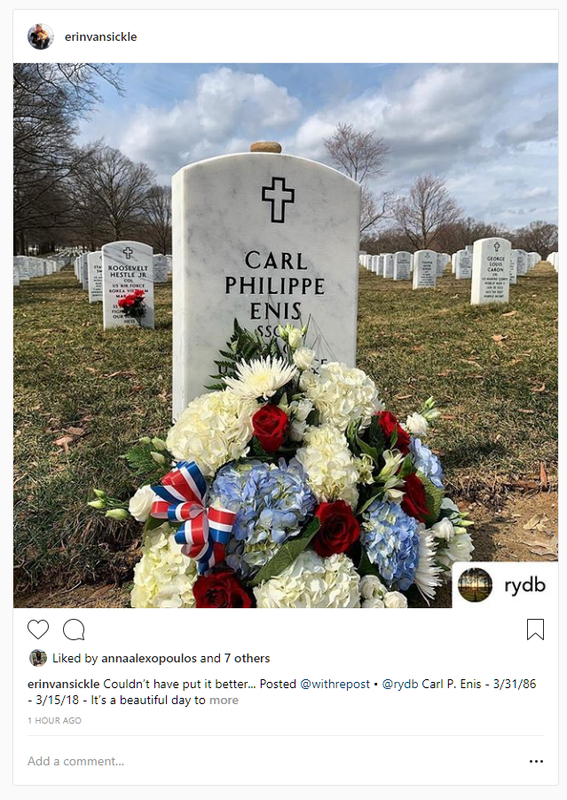 Carl Enis, who was killed in Iraq a year ago. The Senate held a moment of silence for Air Force Reserve Pararescuemen Staff Sgt. 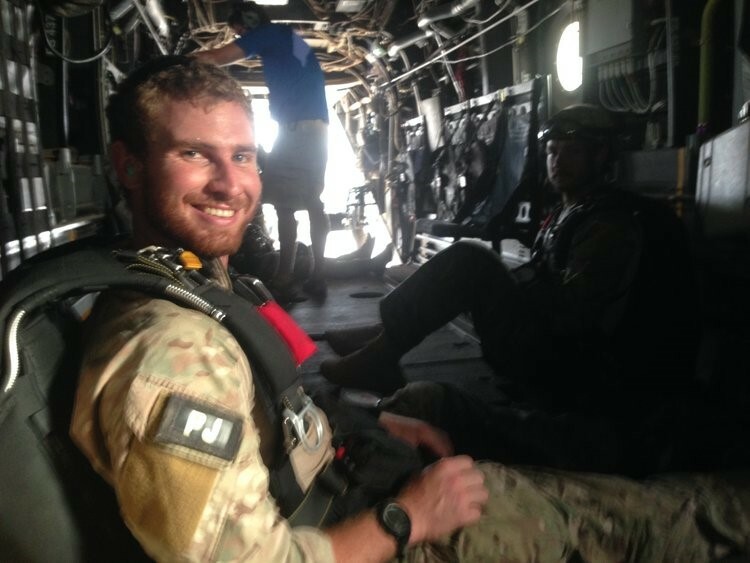 Carl Enis, The Tallahassee resident who was among the seven Airmen killed in a helicopter crash in Iraq, March 15, 2018. “Carl lived and died by the creed: ‘These things we do, so that others may live,’” Montford said. He also recognized Corey and Shana Crum, who were both tragically electrocuted in a Hurricane Michael-related effort earlier this week. No more bear and bird on blue — maybe. After 20 years the “Conserve Wildlife” tag is facing a sales slump. It used to generate $600,000 in revenues for the Fish & Wildlife Foundation of Florida (that’s 24,000 drivers paying 25 bucks a year), but that income has dropped by a third. Art and conservation: A crossover black bear conservation program between the Ringling College of Art and Design in the Patterson Foundation is a wonderful opportunity for students to get real-world experience, says director Angela Leed. Rather than hiring a pro firm to spark interest with a fresh design, the Foundation turned to The Collaboratory, a crossover project of the Ringling College of Art and Design and The Patterson Foundation. Collaboratory director Angela Leed said the opportunity was a “tremendous opportunity” for design students to get some real-world experience. The pros-in-training sent in nearly 100 prospective tags, and the foundation has narrowed the field down to five. Now, everybody has a say. The Foundation has set up a public survey to pick the new design, and voting is open through March 31. The student behind the most popular design will get an additional $1,000 “People’s Choice” award, too. The fashion is noble, but so is the company that makes them. Everyone in the process seems to have a pair of those trendy socks emblazoned with multiple headshots of state Sen. Gainer. 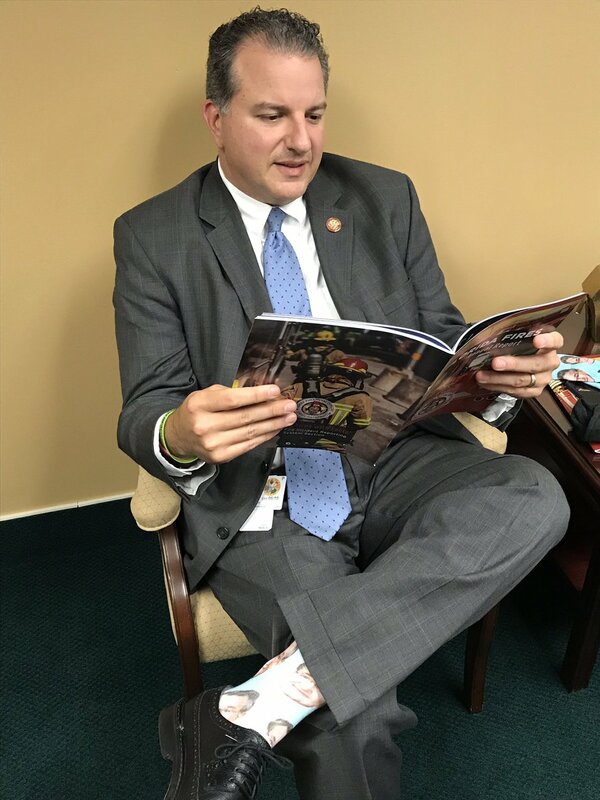 Fancy footwear: Socks emblazoned with the image of state Sen. George Gainer is one of the hottest gifts in the Florida Capitol (Jimmy Patronis is a fan). Also, they are made by a company founded by two FSU students. Of Panama City, Gainer gifted them to fellow lawmakers this year. Attached was a note about Hurricane Michael. Gainer told the Panama City News-Herald that the viral clothing is keeping the storm in the fore. But it gets better: DivvyUp, the sock seller, gives a free pair to a homeless shelter with every purchase. OK, it gets even better: The company began in 2014, launched by two students who were enrolled in Florida State University’s entrepreneurship program. Second-degree seeking ‘Noles have something to celebrate. Four graduate programs at Florida State University made substantial gains in a recent U.S. News & World Report ranking. FSU Provost Sally McRorie is celebrating solid gains in rankings for the school’s graduate programs. The College of Social Work grad track jumped five spots to No. 33 nationwide, cracking the top 20 among public universities. The grad program inside the College of Education rose seven spots to No. 39 nationally, coming in at No. 20 among public universities. The Reubin O’D. Askew School of Public Administration and Policy, meanwhile, advanced three spots, placing among the top 25 nationwide. 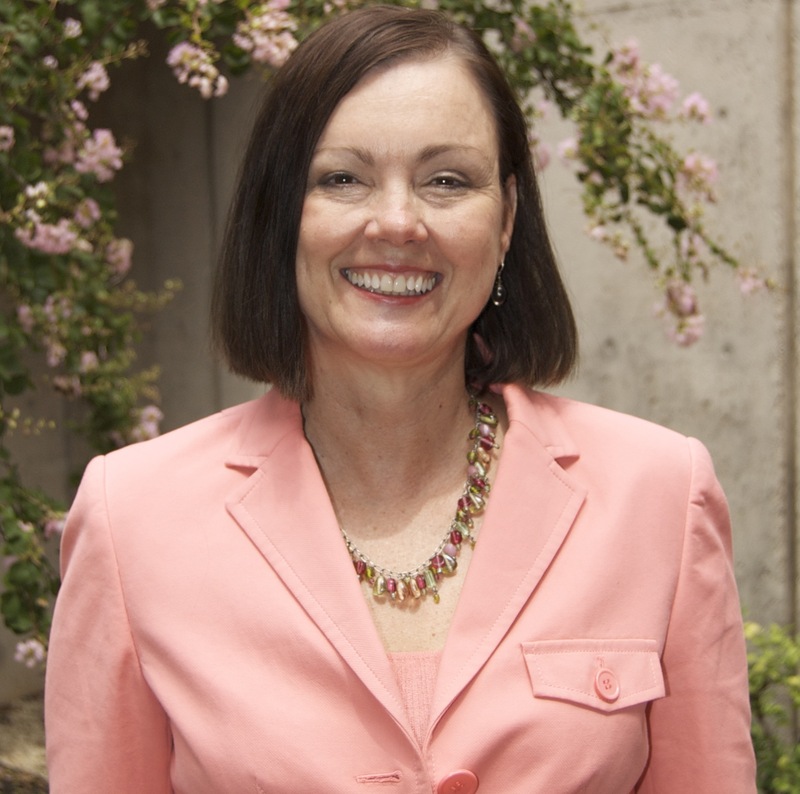 Sally McRorie, provost and VP for academic affairs, said the “rankings reflect the university’s excellence as one of the top research institutions in the nation. Findings recently published in the Journal of Early Adolescence suggest that girls are more likely than boys to notice bullying and interpret it as an emergency. Girls know the right thing to do: FSU researcher Lindsay Jenkins found that girls are likelier than boys to recognize the harm in bullying as either a victim or bystander. A five-step model served as the basis of the study. “Those steps are noticing the event, interpreting the event as an emergency, accepting responsibility for intervening, knowing how to intervene and then, intervening,” an FSU news release said. Middle-school aged boys and girls sampled in the study performed comparatively in accepting responsibility and knowing what to. Girls engaged more than boys in the other three steps. Six-packs of another popular Proof flavor will soon be on local shelves. The brewery recently announced that cans of LaLa Land, an American IPA, are available in Proof’s tasting room at its new South Monroe Street location. 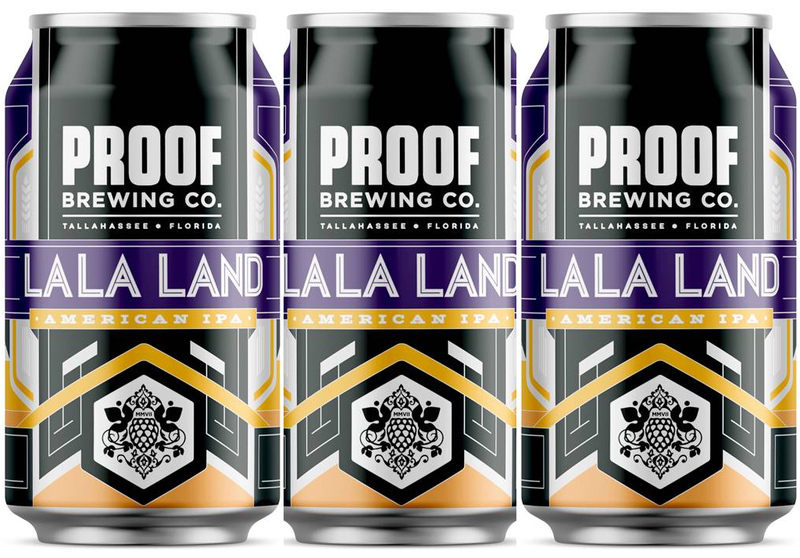 Canned: Proof Brewing Company has begun to can LaLa Land, one of its more popular beers. Expect LaLa Land to soon join the other beers — Eightfive-O and Mango Wit — in nearby shops. A 7 percent ABV, it also packs a punch. The sometimes-annual press skits are back. 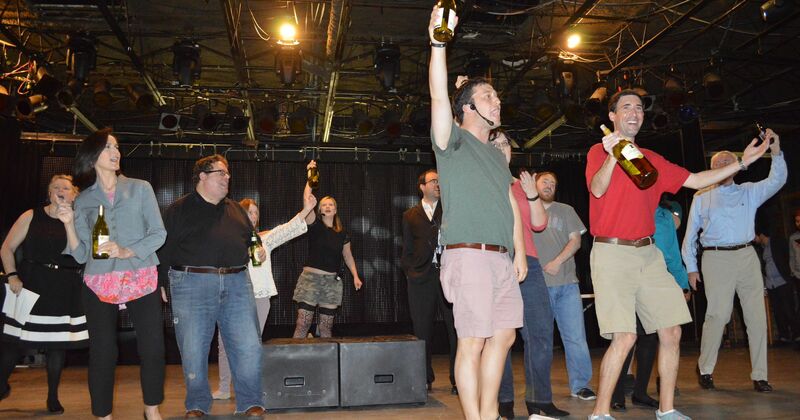 Members of the Florida Capitol Press Corps will take the stage Tuesday night at The Moon. The reason? Roasting state government and everyone in it. It’s baaack: The Capitol Press Corps will hold its annual sendup of Florida politics this week. They’ll be followed up by clips made by state lawmakers — perhaps even statewide elected officials. The House, we’ve learned, has created a “bipartisan” skit, according to House Communications Director Fred Piccolo. Tickets are available online here. Doors open at 6:30 p.m. and the program starts at 7:30 p.m. Proceeds from the event will fund Barbara L. Frye scholarships for future journalists.